The following is a short report on an investigation of the quality of photographic based reconstruction possible given a few recent technology advances, namely, a new version of the PhotoScan software, a new higher quality macro lens, and the employment of camera calibration. All three of these advances appear to be result in a significant improvement over results obtained using the same subject matter from only 6 months previously. 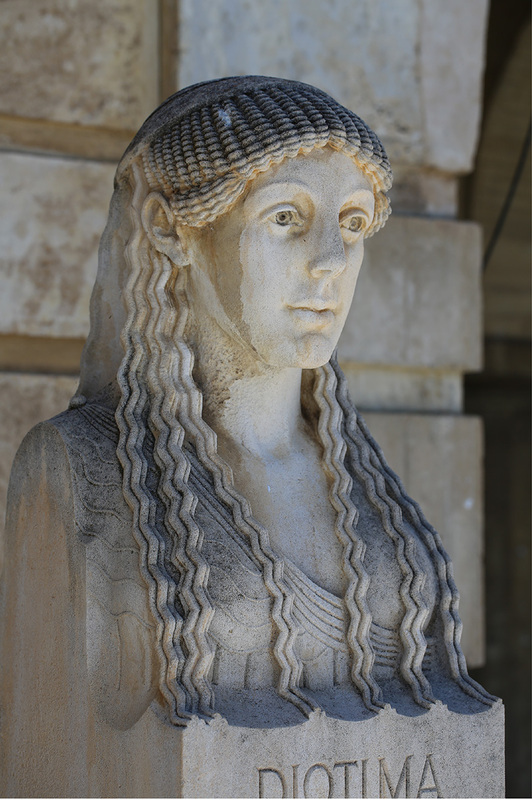 The subject matter is a statue of Diotima located at The University of Western Australia, see figure 1. 10 photographs were taken using the new Canon 100mm macro lens attached to a Canon 5D Mk III camera. 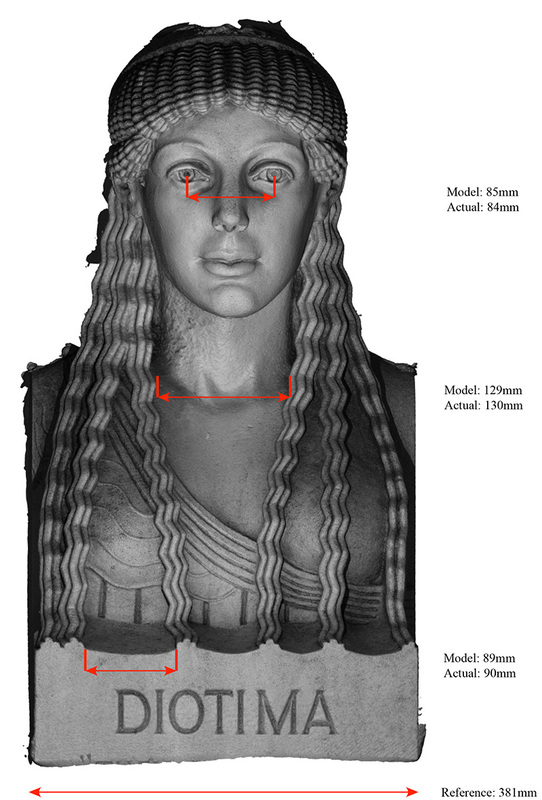 Only the front 180 degree were photographed so no attempt to made to reconstruct the full bust. 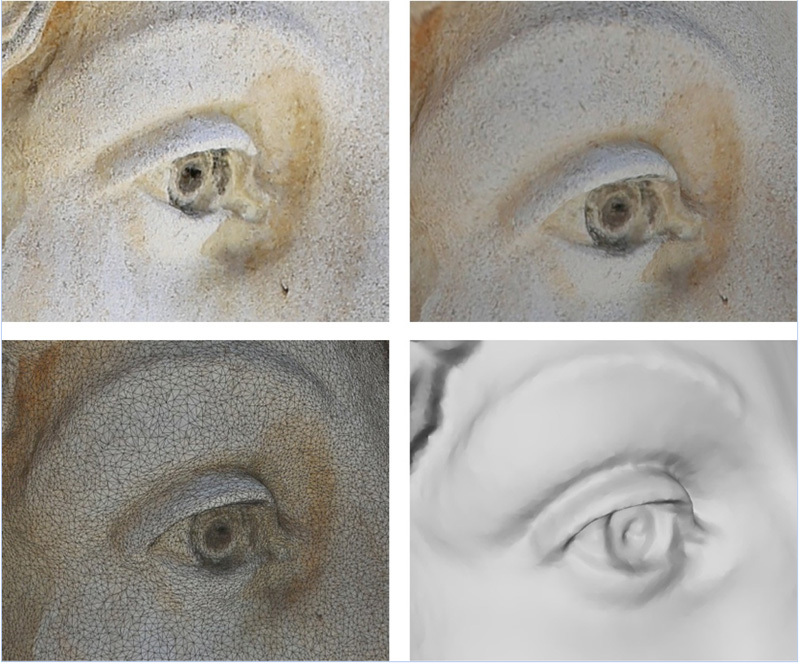 In order to determine the degree of accuracy arising from the lens calibration various measurements were taken of the statue and compared to measurements of the reconstruction. There is no absolute scale to the reconstruction so the base width was employed as the reference. See figure 2 for some spot checks of dimensions, half a dozen were take but are not shown in the interest of image clutter. In all cases the difference between measured and actual is no more than 1mm, well within the error of the actual measurements taken simply using a standard tape measure. 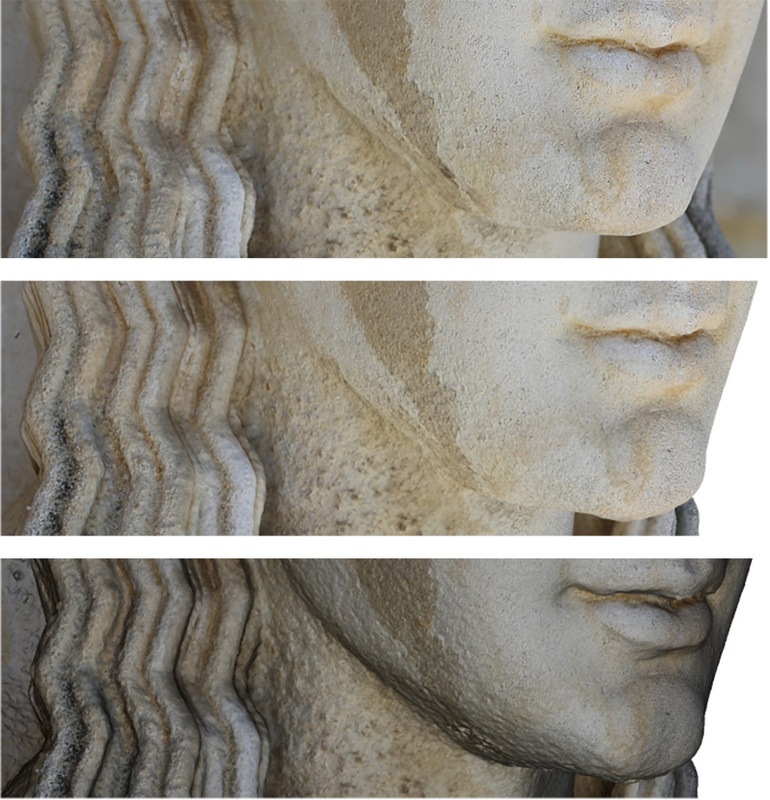 Detail comparisons between the photographs and renderings of the reconstructed model are shown in figure 3, 4 and 5. Figure 1. One of the 10 photographs used for the reconstruction. Figure 3. Top: Crop from one of the original photographs. Second from top: Similar cropped region from a rendering of the reconstructed model. Third from top: A different lighting model intended to highlight possible geometric approximations. Figure 4. Top: Crop from one of the original photographs. Second from top: Similar cropped region from a rendering of the reconstructed model. Third from top: A different lighting model to highlight possible geometric approximations. Figure 5. Top left: Right eye from one of the original photographs. 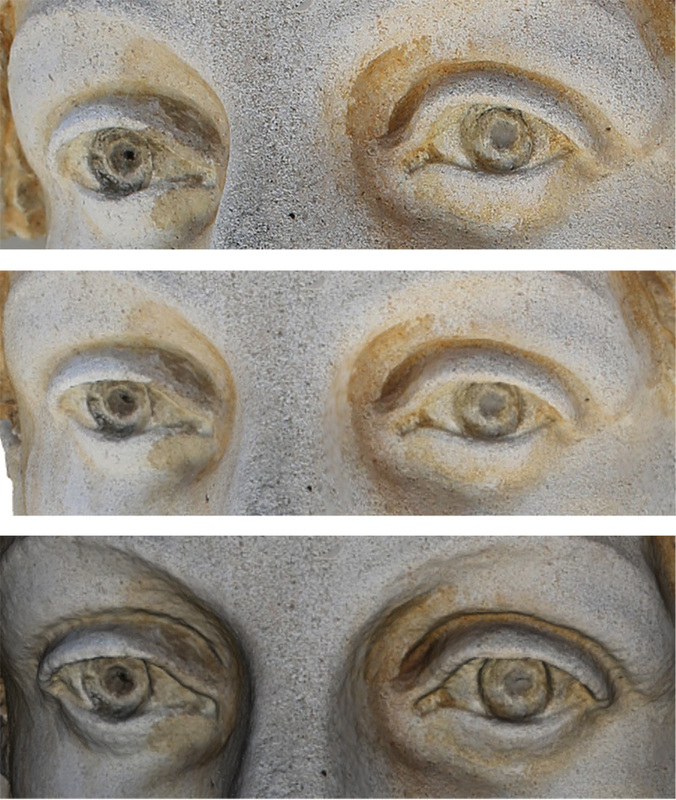 Top right: Same eye from the reconstructed model. Bottom left: Same eye showing mesh density. Bottom right: Same eye without the texture map.